We all like to have a cocktail from time to time but they can be too sugary and high in calories. What can we do to fill our glasses while not feeling guilty? Slim Fast has given us another option. They've come up with a few cocktail/mocktail recipes to help us feel full and satisfy our need for a girls night in. I was sent the Strawberries n' cream shake and used it in the Sassy Strawberry Colada mocktail. 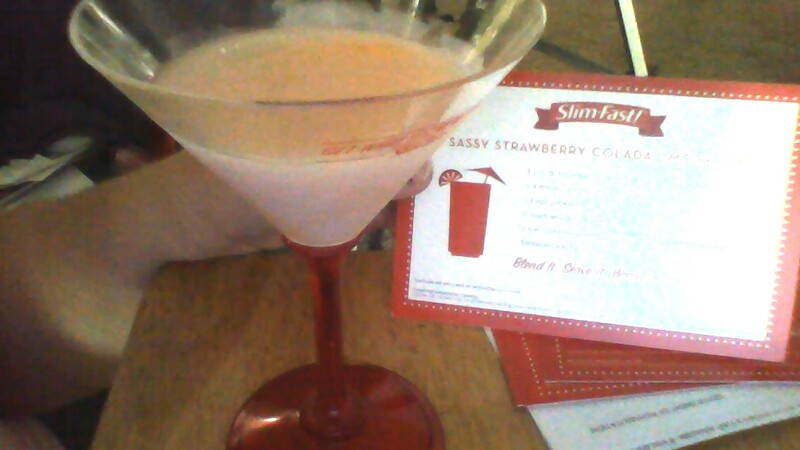 The mocktail was smooth, sweet, and didn't taste like I was drinking a Slim Fast shake. I think that having the natural fruit helped. It was a great treat. SlimFast1 can help you Get What You Really Want this summer! SlimFast products are sold at Amazon.com, as well as other online and local retailers nationwide. 1Losing more than 2lbs per week is not recommended. Exercise 30 minutes daily and follow the SlimFast plan. 2Cocktails are not a part of the SlimFast 3-2-1 plan. Occasional use recommended. You must be 21+ to consume alcohol and please drink responsibly. What cocktail are you going to make over with a Slim Fast shake at your next girl's night?